During the 1700s travel throughout Europe expanded considerably, but was mainly dominated by young British aristocrats and gentlemen on the ‘Grand Tour’, an elite educational experience that peaked during the Georgian era. The sons of aristocrats and landed gentry were sent abroad after school or university, aged 15 and upwards, ostensibly to complete their studies at European establishments, or to have private tuition in languages, mathematics, drawing, fencing, dancing and riding. Youths were usually accompanied by an older tutor/supervisor called a ‘Bear Leader’ and a manservant, tours lasting from a few months to two or more years. Networks of family and diplomatic connections and letters of introduction ensured their entrée into polite European society and theoretically they returned home well-informed and cultured young men, prepared for their hereditary roles as members of the ruling elite. The archetypal continental Grand Tour comprised a stay in Paris and the principal Italian cities. Paris was considered the greatest city in 18th-century Europe, and for some travellers was the main focus: most educated Britons were conversant in French, and Paris, accustomed to tourism, provided fine accommodation and food. The city and its environs offered many fashionable diversions including shopping and gambling, while tourist attractions included the Louvre, the Tuileries, the Duke of Orleans’ Palais Royal, numerous churches and luxury manufactories like the Gobelin tapestry and Sèvres porcelain works. An excursion to Versailles to view the French King participating in the public court rituals of dining, going to mass and hunting was also a highlight. Next, many travellers entered Italy, individual itineraries depending on point of arrival, the season or a desire to view a particular event such as a festival, or a papal coronation. In northern Italy favoured destinations were Genoa, Milan and, especially, Venice, known for its scenic splendours, pleasures and public spectacles. Above all, inspired by the prevailing European interest in antiquity, Georgian travellers considered Rome, with its wealth of classical and Baroque art, sculpture and architecture and flourishing artistic colony, the high point of the Grand Tour. Some spent several months in the Eternal City, enjoying elegant facilities and accessible educational and cultural pursuits, often taking antiquarian courses and buying artworks and antiquities. Many tours ended in Rome, but some tourists progressed to Naples, a desirable destination following the establishment of its royal court in 1734 and initial excavations of classical remains at Herculaneum (1738) and Pompeii (1748). Also appealing was the renowned hospitality of Sir William Hamilton, British envoy to Naples, 1764-1800. Throughout their travels, well-connected visitors relied on British envoys and ambassadors to arrange entertainments, present them at court, handle miscellaneous requests and protect them from the law when they ran into problems. After the mid-1700s, continental tourism expanded beyond the original elite Grand Tour. Increasingly middle-class travellers, more ladies, older tourists, even entire families ventured overseas, reflecting rising affluence, consumerism and general growth in travel and leisure activities at home. As more Britons toured Europe for pleasure, further areas developed. For those on tight budgets a sojourn in Paris and tour of the Low Countries was feasible: Belgium, the Netherlands and Luxemburg. The elderly and infirm began to visit Spa in the Ardennes or Aachen (Aix-la-Chapelle) for their health, and Montpellier for medical treatment. By the 1780s the French Riviera was becoming a fashionable winter resort, Switzerland also attracting more tourists and ex-pat residents. Spain, Berlin and Dresden also grew popular, travel through the Balkans increasing during the Austro-Turkish peace (1739-87). Wars periodically disrupted journeys in particular regions, but passports smoothed passage through conflict zones. Some adventurous tourists visited Europe specifically to witness battles, even the onslaught of the French Revolution. Surviving travel accounts demonstrate the hardships and risks experienced by early continental tourists. The crossing to France initially involved taking the packet boat or private sloop from Dover to Calais or Boulogne, later between other Channel ports. Many voyagers were violently seasick, adverse winds caused lengthy delays or detours and storms at sea could be terrifying. To disembark, passengers usually transferred onto exposed rowing boats, a hazardous operation that sometimes caused injuries and invariably a soaking. Arriving in the dark, when drenched, shaken and exhausted, negotiating unfamiliar French customs procedures and struggling to secure the first night’s accommodation often meant a bleak start to the Grand Tour, putting today’s travel inconveniences into perspective. 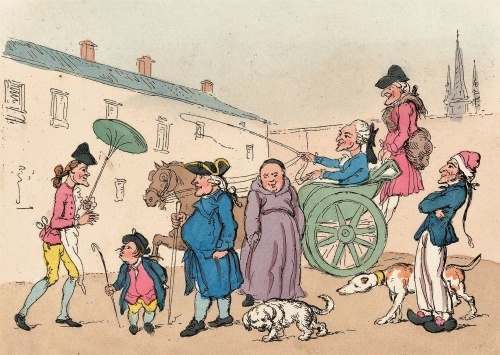 Most journeys within Europe were by road and tourists often hired or purchased carriages on arrival, using the effective posting system whereby horses were changed regularly along major routes. However, many roads were basic, especially in the early-1700s and notably in Germany. On narrow, precipitous mountain passes travellers had to leave their conveyances, continuing by horse or by mule. Adverse weather damaged rural roads, causing accidents and delays while carriage axletrees and wheels were repaired. Illness also took its toll: the flux, gripe, tapeworms and other intestinal problems resulted from bad water and poorly-prepared food; heavy colds, coughs and fevers were rife, as were severe bites and stings from bed bugs and diverse insects. Rome and Naples were avoided in summer, due to the heat and prevalence of malaria. Medical attention was inconsistent outside the major cities and many Britons died abroad. Appreciation of the arts was a major motive for early travel - music, architecture and painting. In Italy, Europe’s artistic hub, wealthy tourists purchased Old Master paintings and picturesque souvenirs of places visited, especially views of Venice by Canaletto. In Rome prosperous travellers commissioned souvenir portraits of themselves posing in contrived ‘classical’ surroundings featuring ancient ruins and antique statuary. These portraits and other artworks acquired by Grand Tourists form the nucleus of some of the British art collections that we enjoy today. Continental and British fashions varied slightly and especially in France, renowned for its luxury textile and clothing trades, travellers spent lavishly on gold- and silver-laced hats and suits, feathers, silk stockings, sleeve ruffles, gloves and fine embroidery. Attendance at European courts required richer, more formal dress than in Britain and Grand Tour portraits display young Englishmen in Rome arrayed in vibrant silk and velvet suits and sumptuous fur-trimmed coats and cloaks, after the Italian fashion. The influence of these ornate foreign modes emerged in England during the 1770s, when fanciful ‘macaroni’ suits and towering powdered wigs were popularly linked to the taste for extreme fashions and rather effeminate manners acquired by some young men in Italy. Today’s whirlwind holidays to global destinations are a far cry from the leisurely continental journeys of privileged Georgian tourists, but their adventurous travels paved the way for later generations and more organised, commercial tourism.